With the current state of the the office market in downtown Calgary, you would expect that companies are only vacating space and no one is taking on new space. While that is mostly true with thousands of jobs being lost in the last 4 years, there are a few companies that have a need for more space, or in some cases, better space. Nexen, which is owned by a Hong Kong company called CNOOC Limited has decided to upgrade some of their office space and occupy eight floors of the Bow. They will be subleasing around 300,000 sq feet from Cenovous which now occupies part of the new Brookfield place tower which took the crown of Calgary’s tallest building from the Bow when it topped out a couple of years ago. Cenovous and Encana, which is the main tenant of the Bow, have both been hit hard by the oil price collapse and more specifically by the low oil price differential that Alberta oil receives as a result of inadequate pipeline capacity. Although these large scale moves are a lot more rare than they used to be, there is still a need for skilled companies to handle the logistics of moving from one building to another, even if it is just across the street. Desks, cubicles, computer equipment and supplies have to be taken down and packed up for the move. Then, they have to be transported by truck to the new location and reassembled. 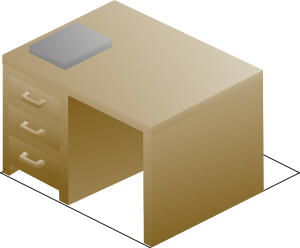 Work crews have to be experienced in all types of furniture installation to make the equipment functional in a short period of time. They also have to have all the right types of insurance to cover injured employees and damage to the office equipment. Make sure you read their online reviews so that you feel confident that you are hiring a reputable company that will get you up and running again without any incidents. So whether you are moving into a world class building like the Bow or into a small suburban strip mall, you need to make sure you hire the right people to make the move for you, or rent the right equipment to do it yourself. Should You Buy A Condo That Has Stucco? There are a lot of things to consider when you are buying a condo whether you are going to live in it or rent it out. You could be sorry if you just jump right in and make the purchase without doing your due diligence. There are too many documented cases of people in Calgary and other cities that lost a lot of money because of some unexpected expense due to shoddy construction on their condos. First, I will list the process you should follow if you are going to buy a resale condo. Use an experienced realtor to help you find and buy your condo. You can start your search on the internet to narrow down your preferred locations and the type of condo you would like, but make sure you get a realtor to take you through the condos. Do not call the listing agent because they are representing the seller. They are legally required to do what is best for the seller, not you. You need your own agent that is a certified condo specialist to look after your best interests. When you find the condo you want to buy, make sure your realtor adds the following buyer conditions into the contract. Financing condition – this gives you a week to 10 days to get your financing approved. This is not the same as a pre-approval. That only approves you for a mortgage, but the bank also needs to approve the property you are buying for the mortgage. Condo Document Review – this gives you a week to 10 days to hire a professional condo document review company to analyze the condo documents. This will include at least a year of condo board meeting minutes, the reserve fund study, and financial statements. This will tell you if the building is well managed and has adequate funds in place for all scheduled maintenance items such as replacing windows, or elevator repair. Home Inspection – Most people only get a home inspection if they are buying a townhouse style condo since those are more like a detached house than an apartment style condo is. However, it is critical to have a good look at the exterior of a apartment style condo since there are a lot of things that could go wrong and cost you a lot of money down the road. Here are some things to look for in any condo. Stucco – This is probably the biggest cause of special assessments for condos in Alberta. A special assessment is when a repair needs to be done on your building that was not budgeted for in your condo fees. If the stucco was not applied properly it can cause leaks and allow moisture to get in behind the stucco which can cause rotting of the structure of the building. This problem can be very expensive and it usually costs each owner at least $10,000 to have it repaired depending on the size of the building. There have been cases where the special assessment has been as high as $100,000 for each owner. If you or your home inspector have any concerns at all about the stucco on the building do not be afraid to ask a Calgary stucco professional such as 5.0 Stucco for their opinion. Watch the video below about stucco problems on condos in Vancouver for some tips on what to watch for in Calgary. 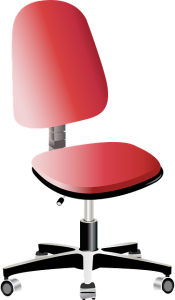 Elevators – These are very expensive to repair and maintain. Make sure this type of work is in the budget. Windows – Are these your responsibility or is their eventual replacement in the budget? Decks and balconies – Again who is responsible for their maintenance. Roof – The replacement of the roof should be an item in the budget. Parking – Is your parking spot titled? If it is assigned, can the condo board change your parking spot without your approval? Pets – You may need approval from the condo board to have a small dog or cat. Condo living is not for everyone, but if you have a busy lifestyle and like to be able to come and go as you please, it can work for you. Just make sure you do your homework or you could be stuck with a special assessment or higher than normal condo fees for years to come. With the new tallest building in Calgary having topped out and nearing completion, it is becoming very evident that Calgary has a skyline that is much more impressive than most cities with a population of just over a million people. Brookfield place is looking great and helping to fill out the skyline in the middle of the downtown core where it seemed like there was something missing before. Now, from just about every corner of the city, the Bow and Brookfield place are visible and impressive, with Brookfield appearing be just slightly taller. Even with the economy suffering through one of the worst recessions in history as a result of the collapse of oil prices, there is still one more signature building under construction that has yet to make an impact on the skyline. Telus Sky is just making it’s way out of the ground on the corner of Centre Street and 7th Ave SE and will surely be one of the most beautiful buildings in Canada once it is complete in 2017. This building will offer a combination of office space and residential rental units. In addition, the first three floors will contain an impressive atrium along with retail and restaurants. Certainly the office component of this building is not needed right now with the scary vacancy rate in downtown Calgary, but they appear to be proceeding with construction anyway. 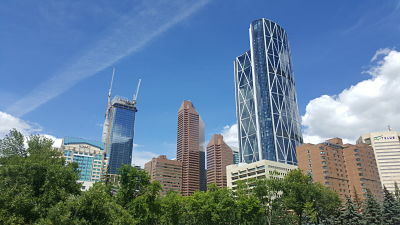 If you have done much traveling in the United States, you would know that places like New York, Chicago, and Houston all have very impressive buildings and Calgary’s skyline is a long way from competing with those cities, but that is not surprising since they all have much larger populations. However, there are some very large American cities that have metro populations of over 5 million people such as Phoenix, Atlanta, and Dallas that Calgary can certainly compete with. In the case of Phoenix, Calgary certainly has a nicer skyline, because Phoenix really has very few tall buildings at all. When looking at Atlanta, they do have quite a few nice skyscrapers, but their downtown is too spread out to look really good. Dallas has a nice skyline but you could argue that Calgary’s is nicer, especially once Telus Sky is complete. Within Canada, there is no doubt that Toronto has the most impressive skyline with the 5 tallest buildings in Canada and the CN tower. They have some really nice buildings and they keep building nicer and taller condo towers, so they will be hard to beat for a long time. There is no doubt that Vancouver has a great skyline, but most of that attractiveness has to do with the beautiful mountain backdrop behind the city. If you look only at the buildings in the downtown, it is not nearly as impressive so I would argue that Calgary has the second best skyline in Canada. Of course, most cities in North America can’t compete with some of the Asian cities and Dubai where they are on a whole other level when it comes to building skyscrapers. 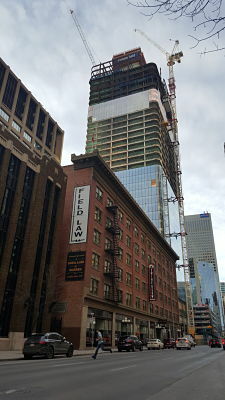 How Is Edmonton’s New Tallest Building Progressing? As we have mentioned on this website before, the Bow will be losing it’s title of tallest building in Canada outside of Toronto any day now to Brookfield Place just down the street. As I write this, it is tough to tell which is taller because they both look pretty much the same height from my area of town in the southeast. However, Brookfield place’s reign will not be very long either because 300 kms to the north in Edmonton, there is a building that is under construction that will be about 3 or 4 meters taller than Brookfield place. That building is being constructed by the engineering giant Stantec, and is being built right beside the Edmonton Oilers new rink that I believe is called Rogers Place. Originally planned to be 62 storeys, it’s height has been adjusted upwards to 66 stories, which nudges it higher than Brookfield. Stantec will occupy most of the building’s office space which will be around 800,000 square feet. It is a mixed used development with 454 condos on the top 36 floors of the tower and about 4 floors of retail which includes a grocery store. I would imagine the condos will be rather expensive since they will be in the tallest building in the city, and outside of Toronto. Regardless that area of Edmonton really needed some revitalization and this enormous project will make the area a lot more interesting and attractive. There were somewhere around 300 trucks used to transport and pour the concrete down into the hole. Those trucks poured the concrete at a rate of about 300 cubic meters per hour which was able to empty about 30 trucks an hour. So, it will be a while before this building starts to make it’s way out of the ground and rise above everything else in Edmonton. My guess is that they will be out of the ground by the end of summer and the building will go up fairly quickly after that. There is also a hotel being constructed adjacent to the building at the same time so that could complicate things a bit. How is Telus Sky Coming along? You have probably noticed that Brookfield Place has now passed the Suncor Energy Centre in height and will soon surpass the Bow and become the tallest building in Calgary and everywhere else outside of Toronto. However, there is another very impressive building under construction in downtown Calgary that will also be taller than Suncor. Telus Sky will be 222 meters tall which is about 7 meters taller than Suncor but 14 meters shorter than the Bow. The building boasts a very impressive design by renowned architect Bjarke Ingels from Copenhagen Denmark. 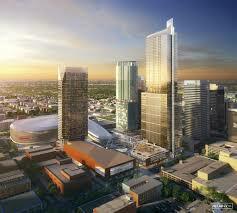 The building will be very noticeable in the skyline and is situated right in the middle of Calgary’s tallest towers. It is directly south of Suncor and southwest of the Bow. The building’s twist will be unlike anything else in Calgary. The building has 750,000 square feet that will be divided up between office space and 341 residential rental suites. Those apartment suites will offer very impressive views because they will be on the upper portion of the building. I would imagine that the monthly rent will be quite substantial since there will be nothing else like this building in Calgary. Construction started in early 2015 and currently the site is a giant hole where the foundation is going in. In fact, they needed to dig one of the deepest holes for any project in Canada. It is 31 meters deep and there were over 80,000 cubic meters of dirt taken from the building site using an old fashioned crane with a clam bucket that was able to grab over 7 meters of dirt with each scoop. They needed to use this method because the building site is so small and there was no way to build a ramp for trucks to drive in and out of. Right now there are two cranes working on the foundation that will hold the building up and serve as a parking garage. Digging the hole and building the foundation often take a long time, but once the building gets out of the ground, progress seems to be much faster. That is at least what happened with all the other buildings that were constructed in Calgary in the last few years. Telus Sky is expected to be completed by the end of 2017. Lets hope this one gets completed because it will look awfully nice in front of the Bow. Back on June 21st 2014 the concrete slab for Brookfield Place was poured over the course of about 25 hours. There were over 65 trucks that delivered 680 loads of concrete which works out to 5,788 cubic meters. 200 people were involved in this rather large operation that disrupted traffic in downtown Calgary. This massive slab of concrete will essentially hold up the building that is scheduled to be completed sometime in 2017. Brookfield will be about 10 meters taller than the Bow, so it will take on the title of the tallest building outside of Toronto. However, Brookfield won’t hold that title for long because the new Stantec tower that is under construction in Edmonton will be about 6 meters taller than Brookfield. Will Edmonton hold the title of tallest building outside of Toronto for long? Probably for many years, since there is a massive amount of office space available in Calgary right now with the collapse of energy prices, and it doesn’t look like there will be a recovery any time soon. So, we certainly won’t see any new office buildings that can challenge Stantec for many years. However there could be a mixed use building that is partly residential condo units mixed with some office space built in the near future, that is taller than Brookfield. Telus sky is a building that is pretty tall at around 220 meters and is actually going to be taller than the Suncor Energy Centre, and it will have mostly condos that will be offered for rent. This video is a very interesting because it shows all the rebar that is required for such a large project and also shows the concrete pour happen from start to finish with a time lapse. The finished product looks nice and smooth but I wonder how long it took for all that concrete to set. I would think that they would have to wait at least a week before they started building on top of the slab. Another thing that is really interesting from the video is the sheer size of the hole that they have dug for this building. I do believe there will eventually be a second building, but I am not sure if it will fit in that existing hole, or if it will require another one that is just as big. Anyway it is always interesting to see how these massive buildings are built from start to finish. I will try to find more videos that show the rest of the construction of this building as it rises to it’s final height. Will Other Companies Come to Calgary? With the collapse of oil prices and the subsequent damage to the Calgary economy, a lot of people are starting to ask who will lease all the available office space downtown? With all the layoffs in the last year, the vacancy rate has gone up to around 18% and some say it could go much higher before the dust settles. Rumour has it that there will be even more job cuts in the first quarter of this year and that will free up even more space in all those buildings downtown. That and the fact that there are several new towers coming online between now and 2018, means that the vacancy rate can only go higher. Add to that, the fact that no one seems to think that oil prices will rebound anytime soon and many are predicting that prices could stay below $40 a barrel for several years. Even though Saudi Arabia is starting to feel the pain of low prices, they seem to be determined to stick to the program and keep pumping oil as fast as they can. So, if prices don’t rise in the near future, who will take up all that excess office space? Well with the high vacancy rate comes lower lease prices. Calgary has had some of the most expensive office rates in North America for years, with only New York and a few other large centres being more expensive. Now that rates are coming down fast, that will give companies that are not related to energy the opportunity to move back downtown. Calgary could even attract some new head offices from other cities now that there are going to be some world class office towers sitting virtually half empty that can be had at a bargain. It takes several years to build an office tower when you take into consideration the initial planning stages, city approvals, and construction. If a company was in a city that didn’t have a building that suited their needs, they might consider moving to Calgary where there is a young educated workforce waiting for them, and several great towers to choose from as their new head office. We will have to wait to see what happens, but the city should be actively pursuing this strategy as a way of diversifying our economy so that we won’t feel so much pain when the next boom and bust cycle begins. How High is the Office Vacancy Rate in Calgary? If you have been downtown in the last few months you might have realized that traffic isn’t as bad as it used to be. This can be attributed to the fact that thousands of people have lost their jobs since the price of oil went into the tank, and rumour has it that there will be more layoffs in January. Of course this frees up a lot of office space which companies will try to sublease to other companies to at least recover some of their cost on a long term lease. While you were downtown, you may have also noticed that despite all the doom and gloom in the energy business, there are a lot of construction cranes still working in the skyline. Some of those are working on residential condos which are still selling at a reasonable pace, since people still need a roof over their heads and apartment style condos tend to start at the lower end of the price scale. However there are several office building under construction that were started before the collapse in energy prices, so they have to finish them no matter what the market is like. I believe the rule is that once you are out of the ground and above street level, you must complete the building. This is a great requirement since it would be a real eyesore to have a building that is half finished sticking out of the ground for what could be years until the market improved. Eau Claire Tower which will be 25 stories and offer another 613,000 square feet to the market. It is also very close to completion. 707 Fifth Street also known as Manulife will be 27 floors with another 564,350 square feet of space. Brookfield Place East will have 1.4 million square feet on 56 floors and stand 247 metres high while taking the title of Calgary’s tallest building from the Bow once it is completed sometime in 2017. Of course, it will also take the Bow’s title of tallest building outside of Toronto at the same time, but even Brookfield’s reign won’t last long. The new Stantec tower that is currently under construction at the new arena district in Edmonton will take the title with a final height of 251 metres. So, now you can see that vacancy rates have nowhere to go but up when you combine all the job losses and new construction coming on the market. According to “Calgary Economic Development” the downtown vacancy rate was 91.% in the third quarter of 2014 and has jumped dramatically to 14% in the third quarter of 2015. Many real estate experts expect the rate to peak at around 18% near the end of 2016, however some think it could go as high as 25%. Then there is the issue of how much space is leased but still empty? Some companies may have some unused space that they haven’t tried to sublease. Regardless, the vacancy rate is high and going higher. What effect has all this available space had on leasing rates? According to some real estate brokers, rental rates have declined to 2005 levels and could fall even more. The silver lining in all that is that smaller businesses might be able to return to the downtown core now that rates are more reasonable. Rates were so high a couple of years ago that even Imperial Oil and Canadian Pacific Rail moved into the suburbs. Calgary could also attract other head offices in different industries now that all the premium space is available at bargain prices. What do the big tech companies have for buildings? It is always interesting to see how certain companies try to use their buildings and facilities to lure and retain talented people. That was one of the reasons that EnCana wanted to build something as amazing and unique as the Bow, and it probably did help convince some people to work for them over the competition across town or across the street. If you had a choice wouldn’t you want to work in a building that is a tourist attraction? Here is an interesting article that explains what some of the biggest tech giants have for buildings and their motivations for building them. The post Innovative Office – What Silicon Valley Entrepreneurs aspire as their corporate headquarters appeared first on Building Radar. Can an innovative office make a successful company? For the movie studio Pixar, the answer is yes. When the company outgrew their old office, the management was aiming for a creative work environment. In his must read “Creativity Inc.” Pixar CEO Ed Catmull describes the process of creating a new headquarter. Steve Jobs took the lead and crafted every detail of the new office building. The building is by now even called “Steve’s movie” by the employees. One key aspect of the innovative office is to encourage random encounters. There are central meeting places and spaces for creative freedom. Employees are encouraged to decorate their work stations. Almost everything about the building is drilled to boost the creative output. Pixar shares some impressions on it’s webpage. In the 1990s than Apple CEO John Scully build the first big headquarter at 1 Infinity Loop in Cupertino. It was functional but fragmented and reportedly Steve Jobs hated it. Since the company outgrew the offices they had to find something new. For years Apple was buying land secretly in the center of Cupertino. The plan was to build a giant open office space, shaped like and UFO. At a hearing at the city council, Steve Jobs revealed its plan. Like other Apple products the new office space is crafted with perfectionism. The technique to bend glass to the rounded corners of the building had to be invented. On 260.000 sqm Apple will fit 12.000 people in one single building. This shall improve communication. The open structure moreover aims for better collaboration. A good 20 minutes from the Apple headquarter lies the central of Facebook. This innovative office was opened in 2011. It has space for 9.000 employees. The area it covers are mere 24 ha. From the outside it appears like a gigantic colorful storehouse. It follows the trend of great open spaces and opportunities for random encounters. In addition, it lays more emphasis on short distances than the Apple-UFO. For the outstanding architecture Facebook employed star architect Frank Ghery. Google opened a new office in 2004 in Mountain View. Formally this was Silicon Graphics grounds. The legendary workstation creator founded by Jim Clark. During the rebranding in 2015 it was one of the first buildings using the new Google logo. Since the structure already existed, Google put quite some effort in making it an innovative office. The redesign of the old buildings appears now like an amusement park. Google goes for diversity and initiatives on the campus. There are bikes, pools, gyms, solar panels, 18 canteens among others. The office space is “only” 47.000 sqm so it is slowly outgrown by the company. How does a great campus support success? To hire star architects is an expense only few companies can justify. To defer cubicles is a risk. On the other hand, to ask for out-of-the-box thinking is quiet a lot if employees are put into them for work. Surely skilled personal and superior management also contribute to company success. An innovative office space is not to make everything colorful. An innovative office enables innovative thinking. Aspects of that are the encouragement of communication. Facilitate random encounters. Allow employees to work in different environments. But also simple things like good lighting and noise reduction. To plan an innovative office is a lot of work. To manage it is as well. There is no single recipe for that. From clean Apple to wild Facebook architecture it has to support the company goals. Office space is the single biggest value statement of a company. Especially in Silicon Valley where the war for talent is tense an extravagant office can also serve as a recruiting measurement.